When you’ve finished wearing braces, you’ll likely need to use a retainer to keep your teeth straight. These orthodontic devices are positioned in the mouth to hold teeth in place and prevent them from shifting. But while retainers can do wonders to preserve your smile, they are also vulnerable to bacteria and food debris that accumulate in the mouth. By following these cleaning recommendations, however, you can keep your retainer—and your oral hygiene—in good condition. 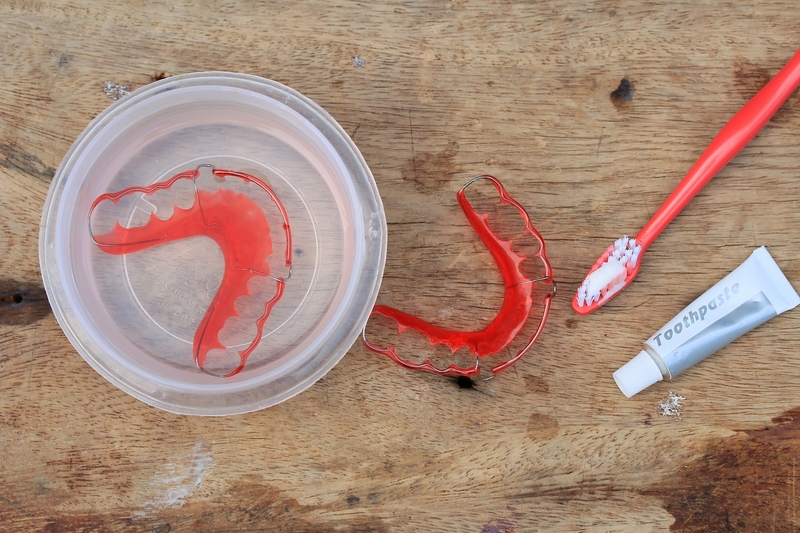 For day-to-day cleaning, remove your retainer when you brush your teeth. Next, gently scrub away food debris with a soft-bristled toothbrush and rinse with lukewarm water. It’s also important to give your retainer a deeper clean at least once a week—or sooner if it develops a bad odor. One way to deep clean your retainer is to mix baking soda with water so that it forms a thick paste. Rub the paste on the retainer, scrub with a toothbrush, and rinse. The baking soda will help disinfect the device without the need for any harsh chemicals. Other methods of deep cleaning include soaking the retainer in a water-vinegar mixture or mouthwash for about 20 minutes, followed by a lukewarm rinse. Some dentists may also recommend soaking the device in a cleansing tablet solution. If you go the soaking route, be sure to follow instructions properly and avoid soaking for too long. Some cleansing solutions can deteriorate the metal components of the retainer. Also, avoid using hot water or exposing the retainer to heat, as this may cause the device to warp. Since fixed retainers are permanently placed in the mouth, they can be a little more difficult to clean than a removable device. However, many prefer this method of braces aftercare, as it is less cumbersome than a removable retainer. Just as with braces, cleaning a fixed retainer requires careful flossing around the device’s wires. To start, thread a six-inch piece of floss between the front two teeth and under the retainer wire. Next, move the floss up-and-down so that you clean between teeth all the way to the gum line. Repeat these steps for every tooth that is connected to the retainer. Backed by advanced dental care resources, Family First Dentistry is a top provider of orthodontic services in Anchorage, AK. Taking a personalized approached with every patient, this family dentist will introduce you to the best braces options for your needs—including hidden braces and Invisalign®. Once your treatment is complete, this clinic will equip you with a comfortable retainer to keep your smile looking sharp. To learn more about their standard and emergency services, visit this provider online. For teeth cleaning and dental exam appointments, call (907) 562-2820.